Create an unlimited quantity of virtual serial ports with Virtual Serial Port Driver. You can assign any name to the created port, including the name of existent serial port. 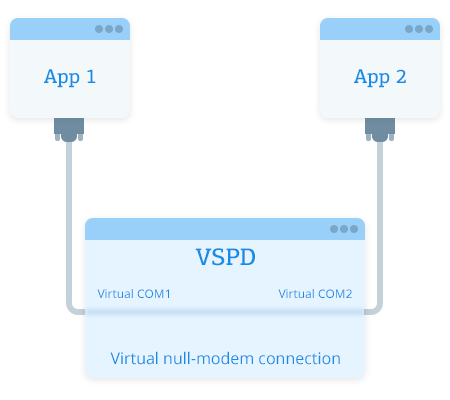 Virtual COM Port Driver connects created virtual ports in pairs with virtual null modem cable, ensuring even faster communication than real ports connected via real null modem cable. Virtual ports behave exactly the same as the real COM ports. Virtual ports support all signal lines and allow any type of connection. The program makes it possible to create bundles of virtual serial ports and put in place custom parameters, making it a solution that can be used in various scenarios. This software lets you split a single physical serial port into multiple virtual serial ports that fully emulate the original port. You can join multiple physical ports to one virtual port for enhanced data transfer. Complex serial port bundles can be created and managed allowing you to transmit serial data in and out of any number of physical or virtual serial ports. Creating main ports augments hardware control line management. Virtual Serial Port Driver PRO enables the connection of multiple physical ports to one virtual port. 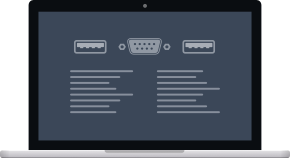 A switcher function ensures your application is provided with a free serial port while seemingly connected to a single port. Multiple applications and devices can exchange data simultaneously by merging virtual serial ports and replicating transmissions. Unlimited virtual COM ports can be added to serial port bundles not divided into ‘IN’ and ‘OUT’ sides. Allows using multiple remote USB devices on your local computer over Ethernet as if those devices were plugged in your local machine directly. Shares multiple serial devices over network so that anyone at any spot on the globe can use them. Shared devices will operate on remote machine as if they were physically there. Monitors RS232/422/485 ports. Serial Port Monitor also displays, logs, and analyzes all activity of serial ports in a system. Splits one real serial port in multiple virtual ports and allows multiple applications use them at once. Many-to-many ports splitting/redirection also available.